Dr. Marion Nestle referred to the film Food Evolution as “propaganda” and the other activists like Zen Honeycutt and the Food Babe are jumping onboard. This implies that the content was misleading, and meant to affect opinions using less-than-honest means. I was really shocked when 45 academic signatories wrote the letter calling the film propaganda from the agrochemical industry. I’m glad to offer you a taste of that propaganda, or should I say, papaya. The film’s first part shows a horrible battle that happened here in my home state of Hawaii. Non-farmers and well-financed mainland activists wanted my family to abandon a technology, the virus-resistant papaya. The papaya was made resistant by genetic engineering, and it was done by universities and government to help the local papaya farmers. It was not the “agrochemical industry”. Mainland activists riled up local agitators by carefully crafting a massive fear campaign in our communities and manipulated a vote against the papaya. Claims were made that it was poison, it caused tumors, it was increasing pesticide use and more diseases in the industry. None of this was true, but in fear of retaliation, the majority of the council voted to ban it anyway. The Food Evolution film crew was in Hawaii because it was the important national story at the time. They covered the story in great detail and presented it as it unfolded, giving plenty of time to the papaya’s opposition. It also shows how farmers pushed back, and Margaret Wille and the County Council then grandfathered the papaya in, even though they believed (the propaganda) that it was carcinogenic and harmful. They were caught in a hypocrisy when one tells the public improved fruits are dangerous but then exempt them with pressure. This is fact. This is hardly propaganda. The papaya works, it saved an industry, and is outstanding technology. So it is very disappointing to me that Nestle, Pollan and 45 others go on record calling this story agrochemical industry propaganda, when it is a far cry from the truth. It is especially disturbing because many of the people that refer to my family’s livelihood as propaganda are graduate students and professors. It seems like a bad career move to call the chronicling political resistance to successful technology agrochemical industry propaganda. It is even more troubling that these are students and professors that claim to be in favor of small-holder family farms and sustainability. The papaya allows my family to sustainably produce a local staple that would be gone if it was not for the technology. If I was a student or faculty member I would think carefully before signing my name to a movement laden with false claims. It seems like the academic road is very difficult today, and when a search of your name shows you standing up against technology and small family farmers, it seems like a short-sighted career move. Your name on that letter symbolizes the rejection of science and the benefits it can have for small family farms globally, who face climate change and it’s consequences. Do you really stand against that reality? If you ever are over in the islands please let me know and I’ll personally introduce you to our “giant agrochemical industry”, which is me, my family and two dedicated farm workers, growing a delicious and valued fruit. 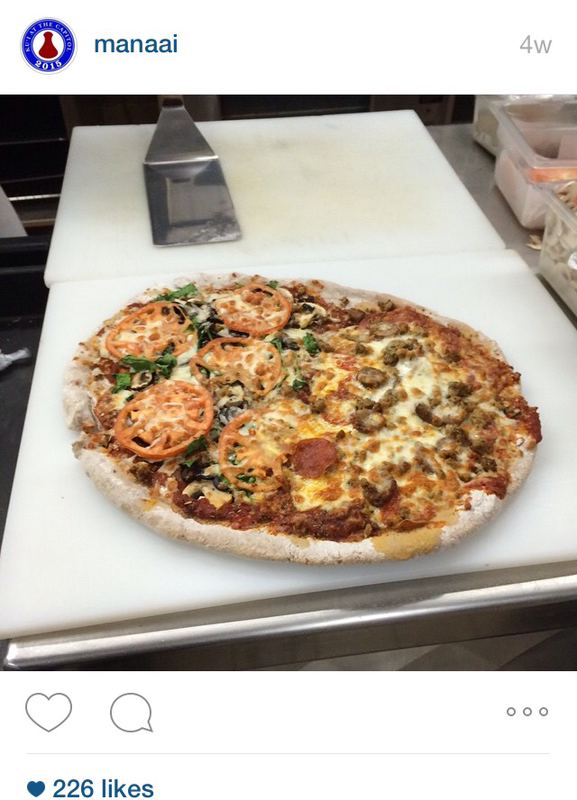 The movie Food Evolution told our story, our fight, and our ongoing success very accurately. I would think very carefully before calling my family’s reality throwaway propaganda. Instead of Protesting, How About Paying Attention? In today’s Civil Beat, a former “anti-GMO crackpot” as he calls himself, Bronson Kaahui, published a great article about the biotech issue in Hawaii. He calls it out for what it is and it’s hitting a nerve with the antis again. I just happened to open up my Instagram account home page and came upon an angry looking Manaai Anthony calling out Bronson about the article. In the comments he writes this so called “challenge,” which almost sounds like a threat. This kind of stuff is nothing new to this guy at all. 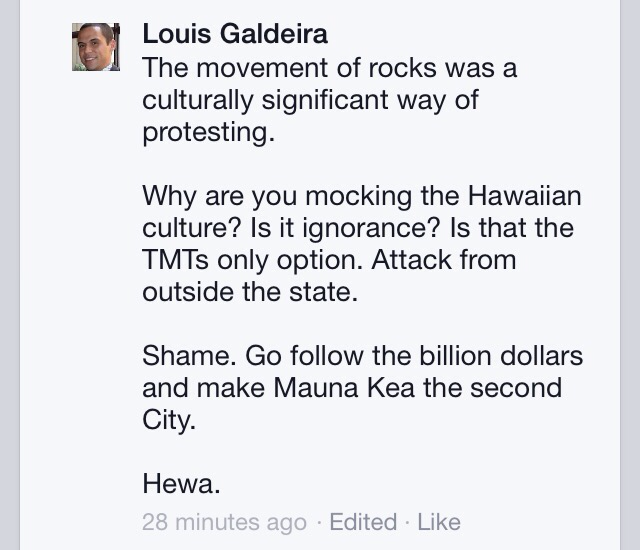 When the Civil Beat articles were hot on the biotech issue, he’d tell people to do illogical things like this. I have to wonder how this really is going to create any productive discussion about biotech. Using this kind of logic, any anti should also consider doing this to match the challenge they offer. You know that if you argue with these people on GMOs, the argument will then shift to the “evil corporations.” He then sells his product to a corporation by the name of Whole Foods Kahala, and not to Whole Foods Kalihi. I have to shake my head at this kind of stuff. The sad thing is he preaches this stuff to thousands of followers. 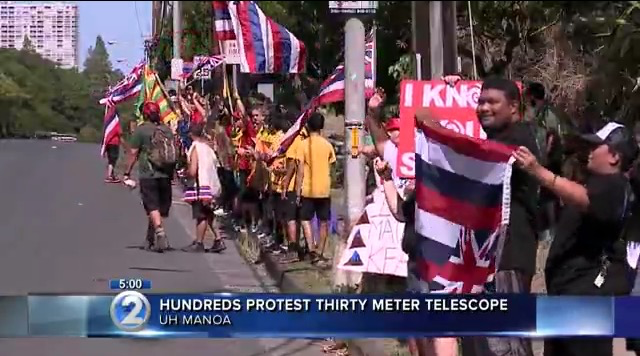 It’s the same with the Thirty Meter Telescope protesters. A commenter placed this photo in response to Richard Ha’s blog post on my page. I sat there and read this, then remembered the protests at UH. This is what was on the news a few weeks ago. 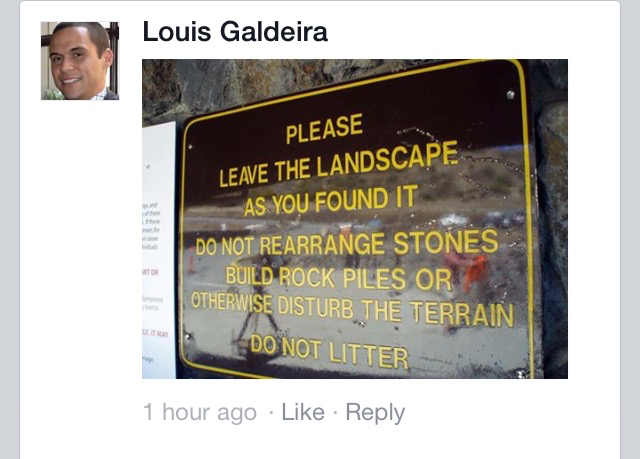 I clearly see the disturbing of rocks and terrain happening and I know those posters and signs are likely landing up in the trash cans. I responded to the commenter with these photos and he made this statement. Something just doesn’t make sense here. If you’re going to say something, you’d better walk the talk. You can’t be making accusations against others and then get upset when you’re called out on it. If you truly want to be credible, then pay attention to the world around you and quit calling everything that challenges your faulty views as propaganda. Louis accused me of mocking the culture which isn’t what my point is. People get swept up into the emotional highs of these “movements,” then don’t even bother to think logically about the world around them. The Hawaiian culture is one that can aspire to the highest height if more of them stop following bad leadership and catchy slogans being pushed on them by people like the Babes Against Biotech and the Center for Food Safety. These people lead with no aloha and their followers reflect it. They yell to others to wake up. Yes, wake up and think before you blast yourself on the internet. Don’t cry out against corporations and wave your nylon flags. Dupont created that material back in 1935. There is a breaking news story that a possible case of Ebola is at a Honolulu hospital tonight. It’s not confirmed however, but this shows how it is indeed a real problem worldwide should it spread. Hawaii is an international hub that so many people travel through making it a prime location for the spread of contagious illnesses. Recall other illnesses that have made it to our shores several years back from H1N1, swine flu, and Dengue fever. Diseases spread and it can be devastating. It is also interesting to note that several aid workers who had been infected with it in Africa managed to recover from this viral illness possibly due to GMO tobacco plants that produced an experimental drug. You can read more about this treatment and outcomes here and watch the video below to hear his story. So while the people of Hawaii are growing concerned about this contagious and very deadly illness, in Maui County, voters are seeking out a ban of GM technology until it is proven safe. Hawaii has the perfect growing conditions to possibly be a contributor to solving this very deadly issue and yet the public will get to vote to block it from happening. Our state could be at the forefront of helping to research and grow medications that can alleviate suffering and death but we’d rather use well read Google scholars to dictate laws that prevent us from being global citizens in helping others. That’s just sad. We are fearing a technology that can save lives but prefer to listen to lawyers from Earthjustice, the Center for Food Safety, and politicians like Gary Hooser, Tim Bynum, Elle Cochran, and activists like Nomi Carmona and Walter Ritte to dictate laws. I can’t help but wonder if political science PhD. Ashley Lukens of the Center for Food Safety is rethinking her stance on blocking this technology when faced with Ebola. Where’s Vandana Shiva and her life saving offer to the people suffering from this deadly disease? Where’s the organic activists like Zen Honeycutt of Moms Across America and her claims that organic cures autism helping to alleviate the suffering of others? Where’s Hawaii SEED and their donations to solve this problem? What’s the SHAKA Movement doing to revamp their ordinance should this disease and others spread across the world? Will we leave ourselves handicapped to do anything to address this problem because we choose the “naturalistic” lifestyle and live in harmony with nature? Ebola is indeed natural and definitely something none of us want. This is a real issue that we need to address and if we don’t, we won’t be ready for it should it escalate further and we’ve shot ourselves in the foot. Think its not real? Think this is fear mongering? Listen to Dr. Kent Brantly, one of the survivors of the virus, tell his story of what is happening in West Africa. I know some people are reading Natural News and alternative health sites that are telling you that Ebola is a made up illness and such. Please have some skepticism and get off of those sites as they are making you look foolish for not even questioning it. Questioning genetics and the science behind it only to call it propaganda isn’t considered skepticism. That’s called being scientifically illiterate and not something you should be professing in the social media. Those conspiracy theories aren’t helping your intelligence and critical thinking or logic either. You can post them on the social media and believe them, but quite a few people know you’ve been made the fool but are too nice to not say it. To pass bad laws like the Maui Moratorium one is irresponsible at best because the touters of it have no idea of the unintended consequences of such an action. Do we want to block our options for very viable solutions because of what someone read on the internet and believes with no facts behind it? I say no and you should too! 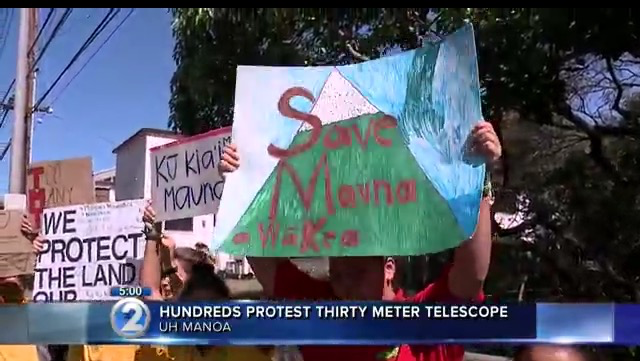 There’s only a few weeks more until the vote in Maui County to place a “moratorium” on the biotech crops. So it shouldn’t be surprising that the activists are going strong with the fear mongering. Here’s the latest scare image that passing around again to spook parents to buy into the ideology. 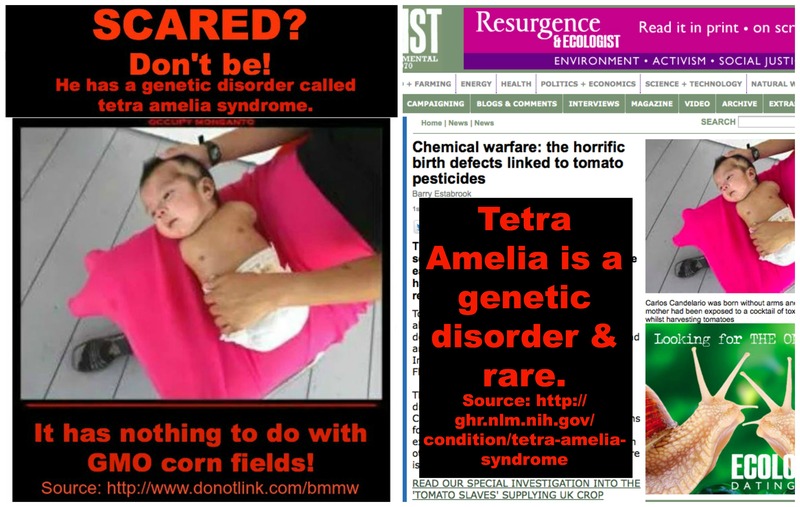 Yes, it is indeed scary and refers to a mother in Mexico who lived by GMO corn crops. Note that Mexico has NO crops approved for commercial cultivation to begin with! And of course on the meme, there’s no source of where this photo comes from and any other details about it. It just is terrifying for the unsuspecting person! However, when you do a bit of searching on this image you’ll see a completely different story of the source. The actual source of the image comes from a well-known anti-GMO website. The story is completely different from the one being told by the poster. It has NOTHING to do with GMO corn fields! 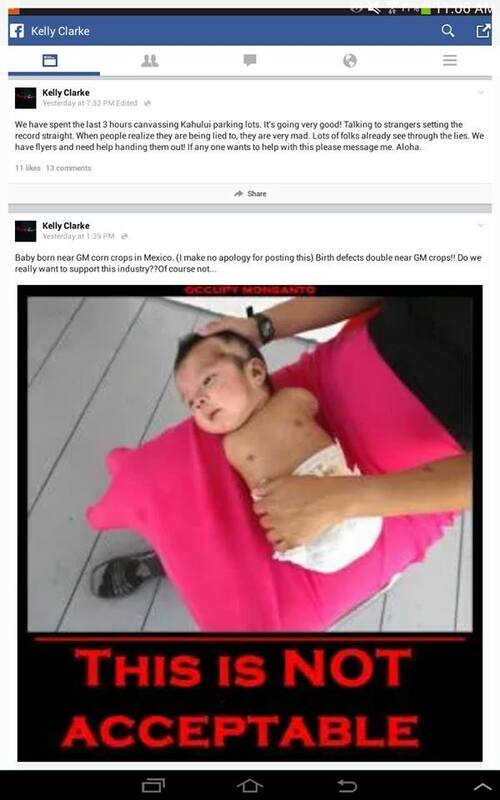 Note that they defects that the baby pictured has is called tetra amelia syndrome is genetic in nature. There is nothing to show that it has anything to do with pesticides and is extremely rare. With GMO crops being grown globally and for the majority of farms in the US, shouldn’t this be more common. It’s not. It’s clear that this is fear mongering at best when you did further for the truth! Here’s a corrected meme that should be passed around the social media so that more people don’t get freaked out by the outright lies that these activists have no problem spreading around. 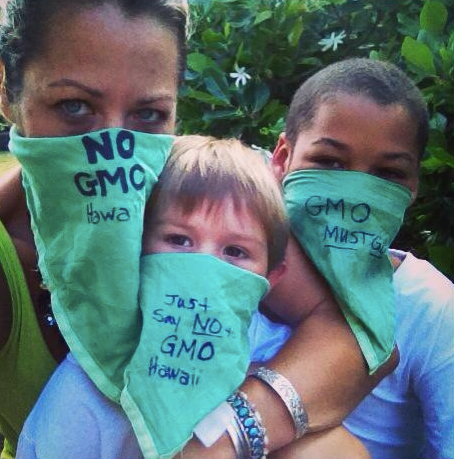 The Maui County Moratorium is now the forefront of the anti-GMO movement once again and I’m seeing the typical pattern of comments from the anti-GMO activists being spewed all over the internet again. Here’s some of the latest ones being posted from a recent Civil Beat article. Why is fear filled statements so prevalent in the conversations lately? Why are so many people feeling as if they are being sprayed or poisoned but continue to stay within the area despite the so called danger? They know the truth but are willing to bend the truth to their advantage in the name of hobby activism and it’s bad news. I’ve decided to look further about why fear is so prevalent in the conversations in Hawaii to get a better understanding of why it has taken root here. This is the definition of fear from Wikipedia. 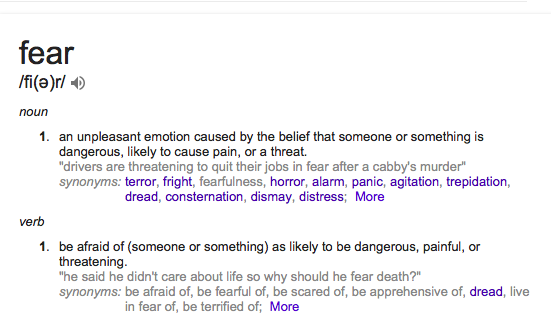 Note the keyword here is “belief.” Fear is the the belief that someone or something is dangerous or bad for you. It doesn’t necessarily mean that it indeed is bad but one is believing that it is. A good example of this is my grandmother’s fear of worms. As a young girl, she was always afraid of it and it remained a part of her belief system well into her old age. She had neither been harmed by them and nor could they really harm her but it was an entrenched belief that she had. Even if the worm was made of Play Doh and fake, it still sent shivers down her spine and sent her screaming. So why do people persistently maintain fears like this even if it is completely unfounded? From the website HowStuffWorks, fear is really our brain’s chain reaction of events also known as the fight or flight response. The article goes into full detail on how fear is created in our minds. It is really an unconscious series of events that occur in our brains. One is the low road which is the “quick and messy” response and the other is the high road where more time is taken with a more calculated precise response of the interpretation. Translating this into the current issue at hand, we can see that fear is clearly being used by the activists here. Lots of internet posts are being touted and the immediate response is to be afraid of the this technology after reading an article or seeing a scary memes on Facebook. 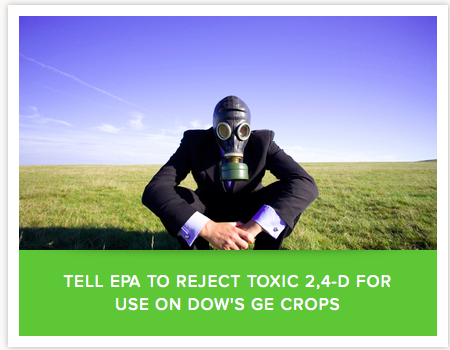 From the Center for Food Safety website of a well suited lawyer in a gas mask. Scary imagery indeed. 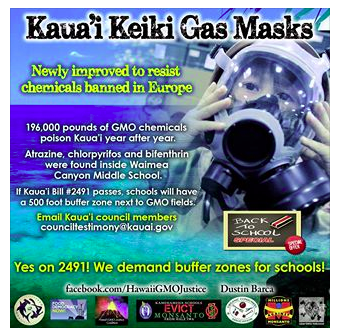 More gas mask imagery from the Kauai Bill 2491 fiasco. Homemade gas masks from the Babes Against Biotech page. People are being made afraid at every single encounter they are hit with, whether it be the media or at a march, fear is the predominant theme of the anti-GMO movement. Their immediate reaction is the maintain the low road of avoid it at all costs because it is believed to be dangerous and harmful. Note that they “believe” that it is a danger and when reinforced over and over by politicians like Gary Hooser and his tirades, it becomes a reality to many of them. When the majority of people lack a good understanding of the history of agriculture and have a little to know science knowledge, this makes for a large population to be susceptible to this kind of tactic. Their high road response this created fear is to now become activists and fight it within their GMO free groups and rallies. This is the calculated, supposedly well thought of response to combatting this belief that they are being harmed. These activists will easily use conspiracy theories, chemtrail beliefs, a misunderstanding of medical conditions and illnesses, and bumble up correlation and causation to justify their actions. When put to the test in the court of law however, there must be proof beyond a reasonable doubt presented in order to support the reasoning, which the activists’ facts will falter when scrutinized. Fear also turns people into ugly emotional people, who are unable to see the consequences of their actions as there are made to feel as if there is not other choice in the matter. You can’t reason or bring these people out of the swimming pool of fear that they are stuck in. 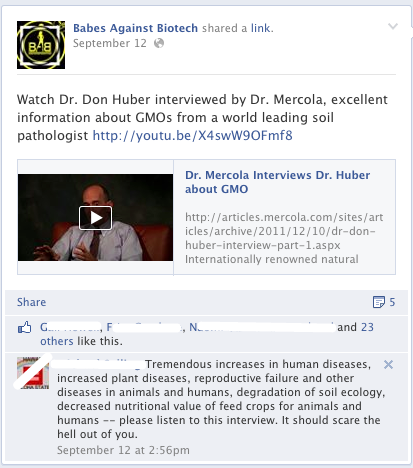 I’ve been in a many discussions online with others and have seen a clear pattern among the anti-GMO activists. When presenting factual information and questioning their links, if they are not able to refute it, one will get blocked and banned by them. 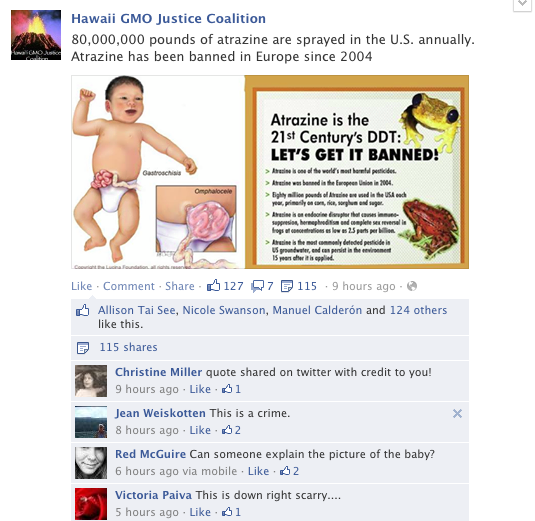 I’ve been banned from the Babes Against Biotech page for pointing out that organic pesticides can be dangerous to bees, and from the Hawaii GMO Justice Coalition page for asking the death threats to stop. I was even blocked and banned by a politician wannabe, Kent Fonoimoana, for pointing out how environmentalist groups are trying to block farmers from farming. Challenging an anti-GMO activist to look further about the issue gets most people instant, “I don’t want to talk to you anymore.” It shows how unreasonable they are about discussions and dialogue which is not what we need in Hawaii. I’ve never posted anything heinous or threatened anything, and just simply questioned their logic and reasoning for their stances and bam, I get blocked or called a bully. Forget the fact that I get nasty emails or comments on this blog which I refuse to allow. It’s clear that people who align with this “movement” are not about discussions or are ready to be questioned on some of their stances. They want one thing alone and that is all their seeking. These outside activists have even gone as far as trying to infiltrate our agricultural communities by bringing in their fellow Filipinos to try and split them apart. Here’s a flier that was posted around the internet to demonstrate this. 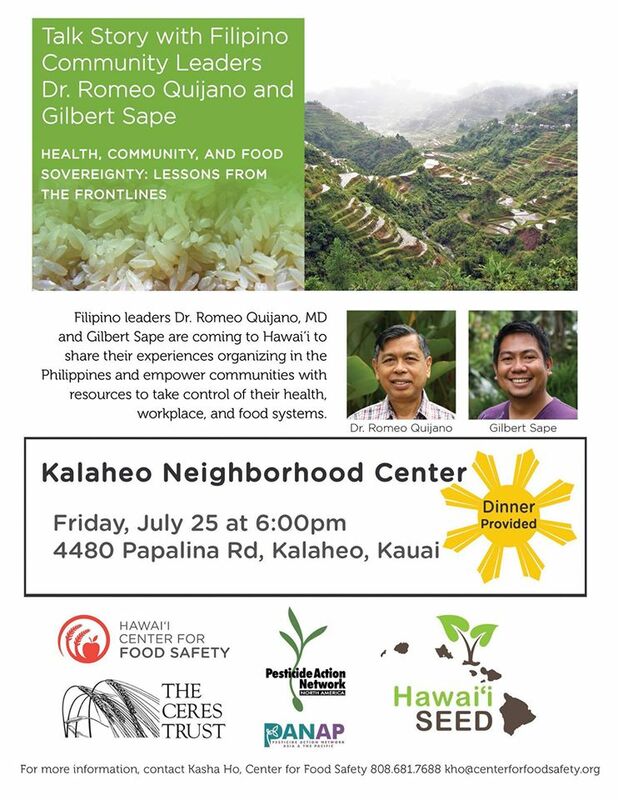 Note the funding on the flyer indicates that it’s all mainland funded groups like the Ceres Trust, PANNA, PANAP, and the Hawaii Center for Food Safety, who provide more outside non-profit money to the local sounding, Hawaii SEED. Their goal? 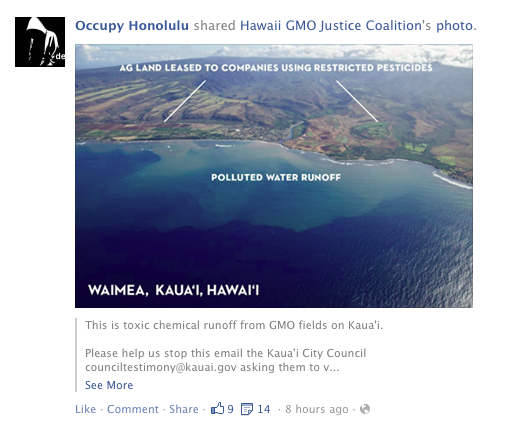 Tear communities apart and take apart agriculture in Hawaii! The same motives apply to the SHAKA movement, who disingenuously claims they want safety studies before the agribusinesses can farm. Why do so many of these members also belong to GMO free groups?! Their true intent is clear when you research it further and it is unacceptable to me to use fear, false intentions, and misinformation to tear apart our Hawaii communities. None of these groups are about living together as they don’t care and nor do the funders of these people care because they are living off in Washington, D.C. and the San Francisco having a ball seeing our communities being torn apart. That may be the mainland way, but it sure isn’t the Hawaii way. What’s even more disturbing about the SHAKA movement is how many of these people said that they will replace the lost jobs with “organic, sustainable farm jobs.” When it’s pointed out that organic farming only provides 1% of Hawaii’s food, the response changes so quickly. The activists cover themselves up with, well, these people can go on welfare, which is an acceptable solution for our communities to them. People with real jobs and families do not want to live on welfare and why is an outside person dictating that to our local folks?! Maui County Council member, Stacey Crivello, pointed out a sad fact in a recent news article on Maui News of what happens when activism succeeds in our islands. When Walter Ritte’s antics managed to get Molokai Ranch closed, hundreds of people lost their jobs and their homes to foreclosure. Others came in and bought up these homes at foreclosure prices and the original owners became tenants in their own homes. That definitely is the breaking of the human spirit that Stacy Crivello mentioned in her commentary. People dream of one day owning a home that comes through handwork and dedication and it will all be lost when a bad law is passed. The anti-GMO movement in Hawaii has become one of manipulation of people’s fear and repetitive misinformation campaigns to tear apart “the companies.” However, upon deeper inspection, it’s not tearing their intended target apart, the reality is that it’s tearing our families and communities apart. It’s not about facts, logic, or reasoning either. We are slowly eroding at the very essence of Hawaii that brought us together to begin with, bit by bit, piece by piece. I see it the issue like a haku lei that has so many distinct component in it that put all together make it beautiful. If we keep picking it apart and try to put only one item in it, is it going to be as beautiful and diverse as when it was first put together? No. We need all parts of the lei, from the big dendrobium, to the ti leaves, ferns, baby breaths, lokelani blossoms, and the very core of raffia that it sits on to be that beautiful lei. If we remove the core that supports the pieces, we will have nothing left to work with and our lei will just sit in pieces. That’s exactly what is happening to our Hawaii communities with outside activism attempting to rip out the very base of agriculture in our state. If we as the public allow this to happen, we will not be able to have a working and functioning system to build upon. Like the haku lei with no raffia or ti leaf as its binder, the whole lei will be nothing but bit and pieces of flowers and greenery that is now wearable or as beautiful. That is not a reflection of the diversity of our Hawaii agricultural communities. Mainland based activism isn’t able to see the very foundation of our heritage of this “local style” and are ready and willing to destroy it in any form and fashion. I will not standby and let this happen and nor should anyone else. 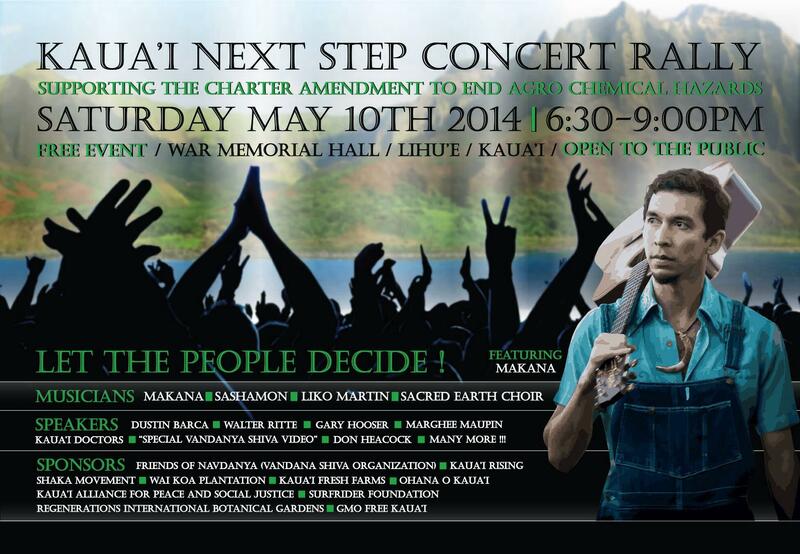 Once again, there is an upcoming anti-GMO concert party going to happen on Kauai. This poster is going around the social media right now touting this event. This is the hip thing to do in our islands, have a big old shin dig. Once again the lack of awareness of these activists are glaring. There’s Makana with his GMO cotton overalls and cotton GMO aloha shirt with a guitar that is coated with chemicals. He tries to look as if he is a farmer that is speaking for farmers but in reality, is just a musician. He’s the idol of the GMO Free crowd right now so its time to keep the iron hot! This concert will likely have high tech devices like speakers and instruments that were made by a multinational corporation but they will scream in horror of their alleged atrocities. They flying in people like Vandana Shiva from around the world who’s job it is to scare and outrightly disinform people. Forget the fact that she’s not coming here on a home made wooden boat from India. She’s a jet setter traveling all around the world and corporate made high tech planes that guzzle tons of synthetic, earth polluting jet fuels. She wants to save the world with her message of being green is good and use lots of GMO guzzling cars to get to these concerts. She’s out to save the world while polluting the earth. The concert attendees are earth lovers who wave their hands with peace and love for they are doing the aina a favor. All the meanwhile they are using oil burning power to dance, sing, and party. They eat and drink from corporate made beers or foods that were brought in on gas powered ships to feed the people for that day. The majority of what they consume likely is GMO and they aren’t choking on it that day. 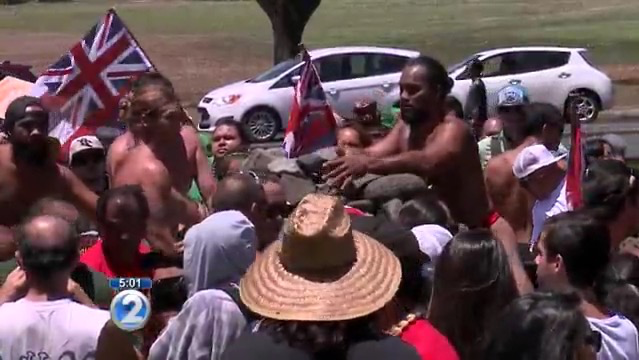 Tens of thousands of dollars and hundreds of human energy are joined in that one spot for several hours socializing and reinforcing their beliefs about this Hawaiian sounding movement. They are bonded by this need to save the earth from the poisoners of the world but then don’t even realize their own poisoning of the world. Tons of trash created by food containers, beverages, and posters fill up the dumpsters that fill our landfills on the island. It piles on the same trash that was created from all the Bill 2491 hearings and the labeling bills. The multiple marches held throughout the year is also buried in the trash mound too, and leeching into the aina. The sewage created by this gathering is also enormous. It all goes into that fossil fuel powered sewer systems to be processed to save the land from toxic human waste. These people are worried about their water systems but don’t worry about their own impacts on water either when they gather together. The concert will eventually end and lots of photos and videos of this momentous event will fill the corporate owned social media sites like Facebook and YouTube. These people yearn for the “old days” where things were so much better but will never forget to bring their latest corporate made IPhones or smartphones. Without this high technology, these activists are lost but they still refuse to accept the “evil” ways of modern day farming. After all is said and done and all the human energy is expended, was there truly a positive impact from what they did? 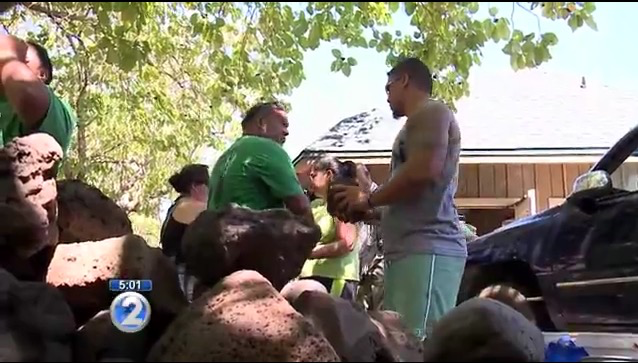 Was there a piece of the aina cleaned that day to keep sea life healthy? Were human lives saved by spending half a day at a concert? Will people be fed sustainably by this day? 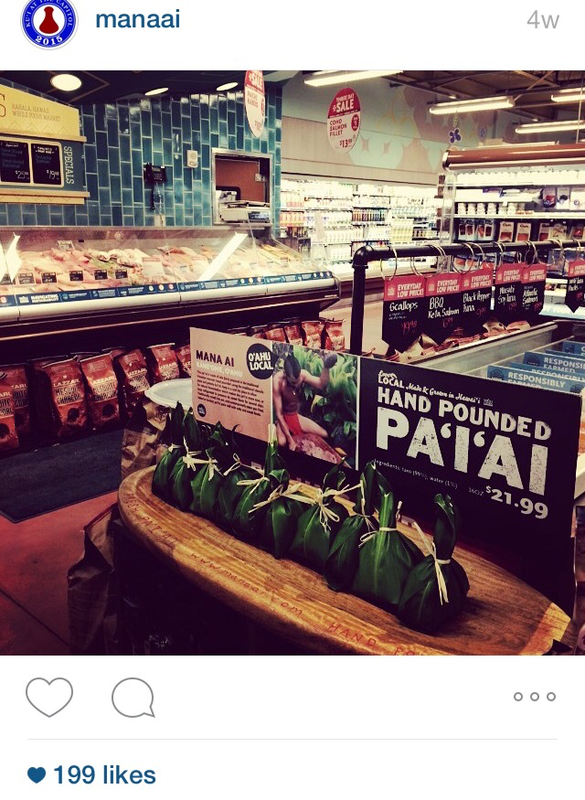 Did they work towards making Hawaii more food secure? Was the money spent going to last towards a greater cause to actually help farmers keep farming? Like the transient nature of a concert, so are the actions of these activists. The current fad is to be anti-GMO right now. Forget about the long term consequences of what they re asking for because they can’t see beyond the next concert. They will still go on wearing the textiles that they protest and buy the food and fuel that they fear but acknowledge consuming. They cry, “Let the people decide,” and don’t even realize what they reap the rewards of in their own lives once again. What does all of these images share? It’s all about fear mongering. There is no evidence that goes along with many of these pictures and memes, but just the image alone is powerful enough to convince activists of some horrible outcome as the result of any farm other than organic ones. No one ever seems to crosscheck these statements either and thousands of people just believe without a hint of skepticism. My grandfather was one of those folks that saw things and just believed it. He loved to watch wrestling and was convinced that it was real. My dad would tell him that the stuff he was watching was faked and scripted, to which he’d say, “No way, it’s real!” The funniest thing was that when there was news of Neil Armstrong landing on the moon, he refused to believe it and said that it was fake. The old saying that a picture is worth a thousand words still applies to this day as we are seeing with our anti-GMO activists. These pictures that are constantly being put out there on the social media to people who lack that ability to scratch their heads and say, “Now is that for real or what?” Neither to many of these folks even know how Google operates to pull up the fear laden sites too when they do a search. It is of no surprise that the fear lovers are going to start up once again by bringing in Tyrone Hayes in May. 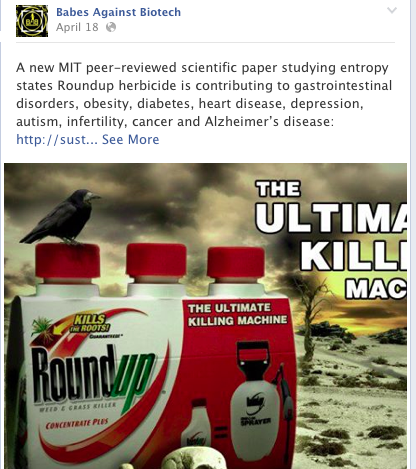 They have lost their love our RoundUp and didn’t succeed in getting Senator Josh Green to ban it. Their newest love affair is now with Atrazine and Tyrone Hayes. Before the anti-GMO club goes berserk on this year’s chemical, Atrazine, let me show you how to do the head scratch bit before you just believe it all. You can read more about the selective reporting done by the author of the article posted by the Babes Against Biotech too. I’m no Google search expert by no means but I am always asking to debunk things because I don’t straight out believe it. 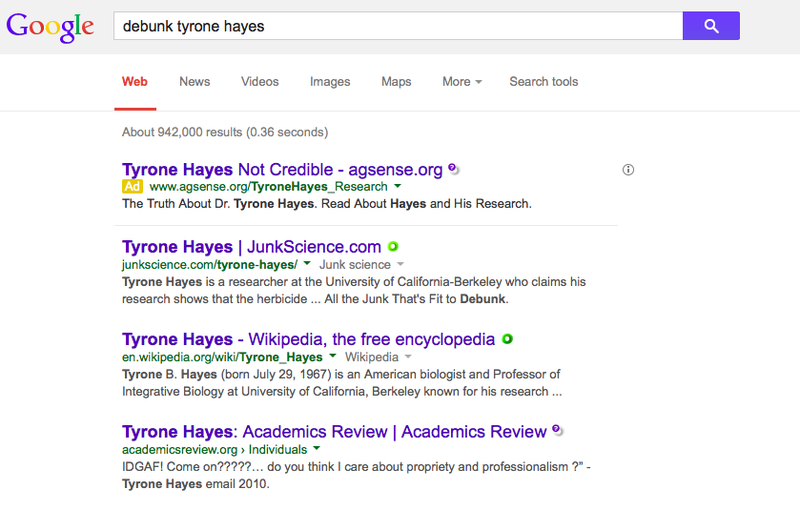 If you enter into Google “debunk Tyrone Hayes” this is what you’ll get in this search. 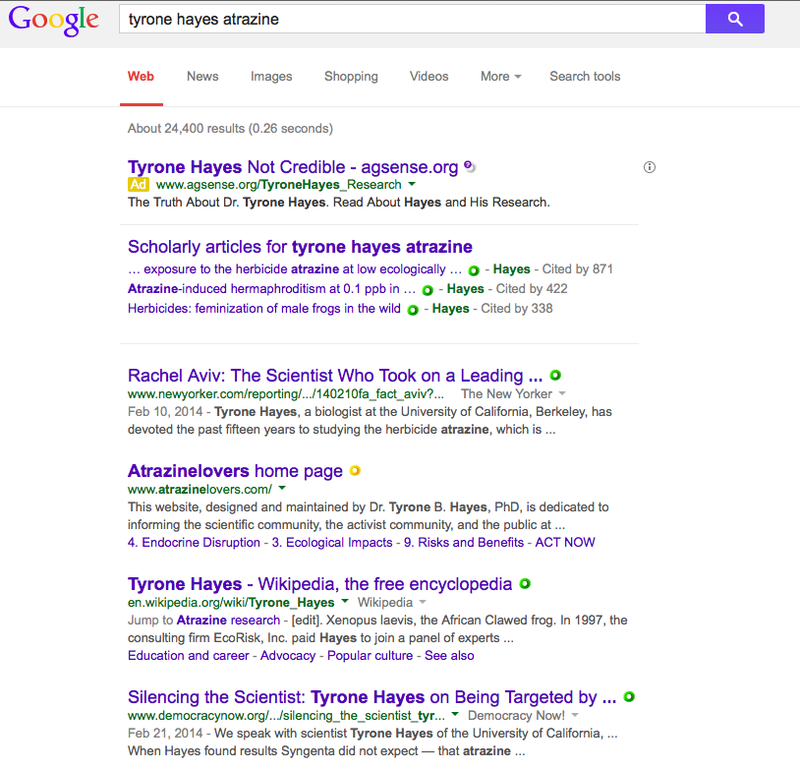 If you do another Google search, with Tyrone Hayes and Atrazine, you get a slightly different picture with a bit more of the activist sites like Democracy Now and his own page, Atrazine Lovers. His academic papers also come up on the top of the search. If you’re afraid of reading too many words on Google, like most activists, then you’d scurry on over to their next best research site, YouTube. 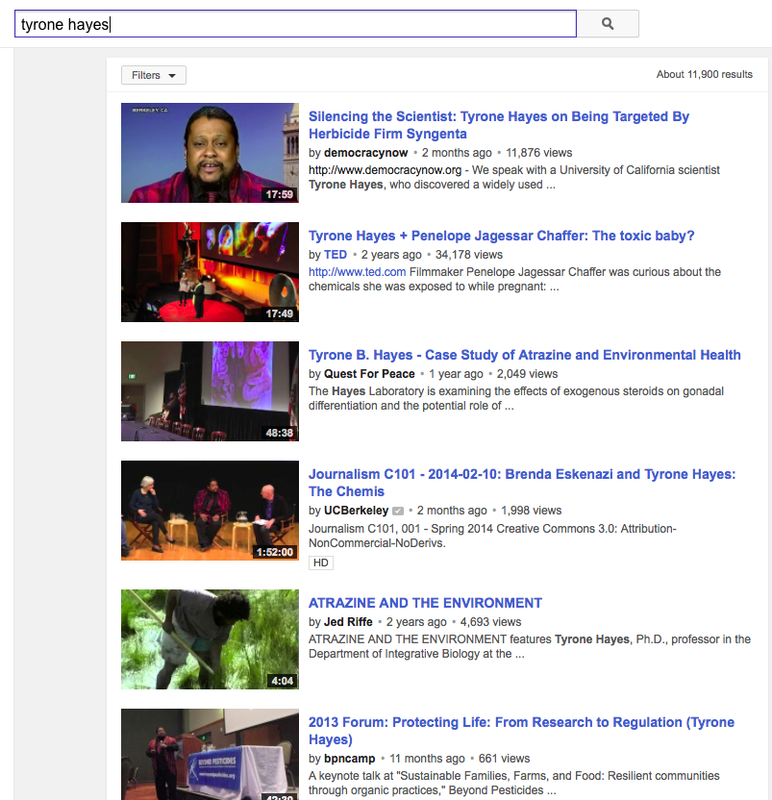 What do we find on YouTube when we search for Tyrone Hayes? Let’s see. Holy Atrazine-ites! All you get is activist videos that are full of fear mongering. Typical anti-GMO ways again.